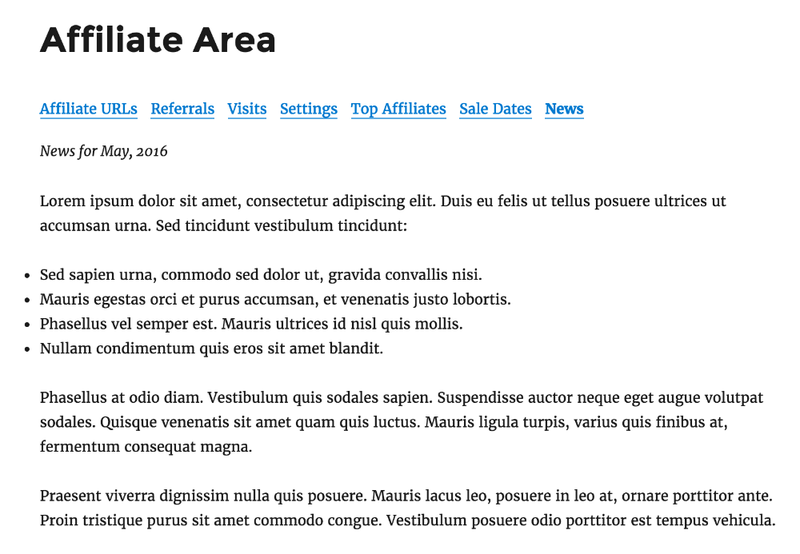 Note: This article relates to the free Affiliate Area Tabs add-on. 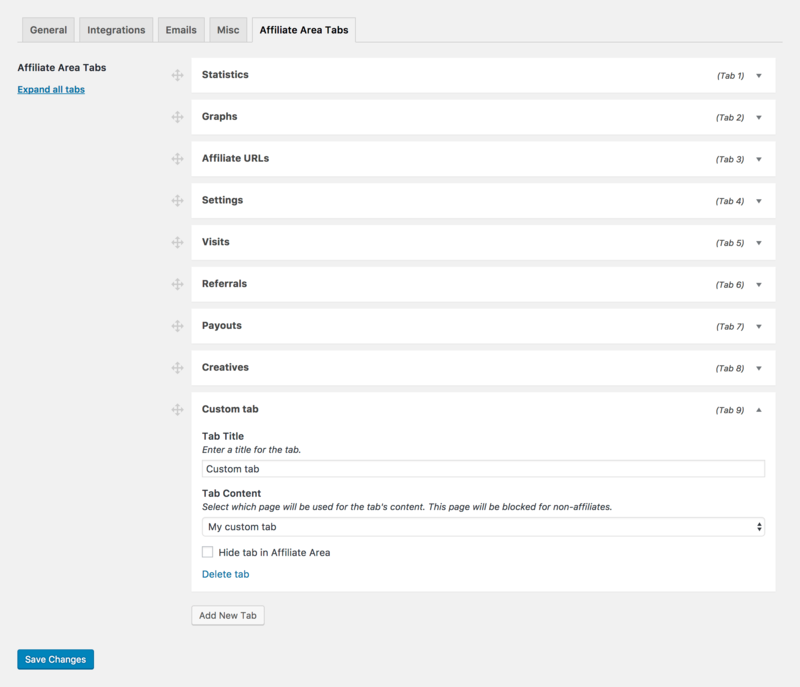 Default AffiliateWP tabs can be hidden from the Affiliate Area. Click the tab (anywhere in the white bar) to expand its options. Click the Hide tab in Affiliate Area checkbox. Click the Add New Tab button. Enter a title for the tab in the Tab Title field. Select a page for the Tab Content. You'll want to create this page first if you haven't done so already from the WordPress pages section. Pages assigned to a tab are only visible to affiliates. If a non-affiliate tries to view this page on your website, they will be redirected to the affiliate login screen. To add more tabs, repeat steps 1-3 above. Your custom tabs can be viewed in your Affiliate Area. This is the page defined as the "Affiliate Area" at Affiliates → Settings → General. Note: If you cannot see your Affiliate Area, make sure you have added yourself as an affiliate, or are logged in as an affiliate. Tabs can be reordered by simply dragging and dropping them into a new location. Use the arrow icon next to each tab to reorder them. When you're finished reordering your tabs, click Save Changes. Click the Delete tab link. Confirm the deletion in the pop up box. Note: If you are integrating with WooCommerce, do not add the My Account page as a custom tab, otherwise, all traffic will be redirected to the affiliate area and required to login as an affiliate.